I am working with a client from Santa Monica, CA who is in the process of Feng Shui-ing his bedroom. It's usually suggested to use pink in the bedroom because it associates with the energy of "partnership." It's important to note my client's bedroom is located in the wealth section of his home. This creates a double connection between partnership and wealth. Using the suggested accent colors of wealth was no problem, but using pink to acknowledge partnership did not fit his aesthetics. Taking this into consideration we came up with flexible remedies. Accent colors of purples, greens, golds, silvers (metallics in general), touches of blues and/or splashes of red help honor the life section of wealth. Each color relates to an element that nurtures the growth of wealth which includes wood, metal, water and fire. Even though none of colors mentioned are pink, when used mindfully they create a soft feeling. This is another way to associate with partnership. Looking at the before and after photos you can see the simple changes he made. The small cowboy image was replaced with the "flower of life" drawing. The flower of life has a softer presentation, deeper meaning and displays some of the traditional accent colors of wealth (blues and metallics). 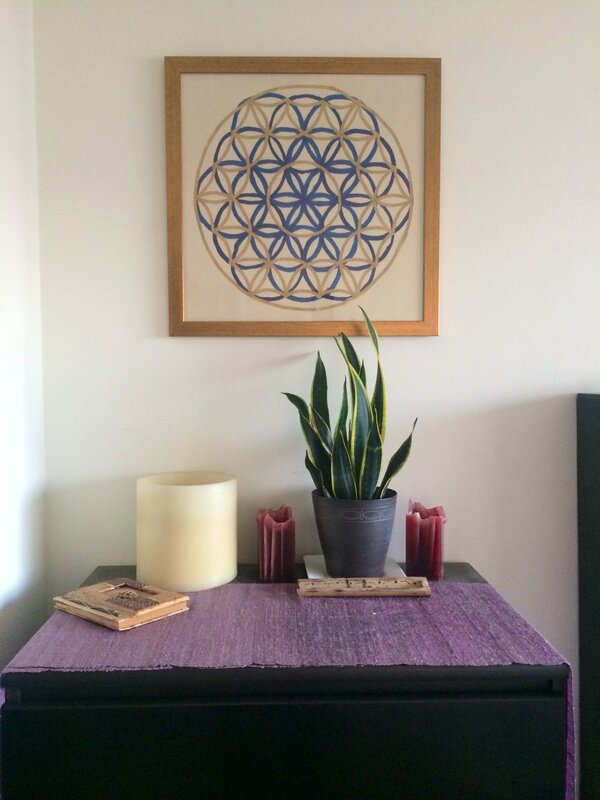 He also kept the purple cloth and snake plant, which are wonderful contributors to wealth energy. The above photo illustrates his final steps. He removed any additional objects that really had no meaning and reason for being displayed on the dresser top. The two red candles were left as a symbolic gestures for partnership. He also kept his lucid dream journey and the large white candle for ambiance during evening hours. Looking from start to finish, you can see he took his time observing this section of his bedroom. He intuitively and intentionally made changes, while editing as needed until his choices reached its optimal blend of textures, colors and meaningful objects based on the Feng Shui suggestions provided to him.